Jacqueline Wong‘s (黃心穎) affair with Andy Hui (許志安) became the talk of the town following the leaked dashcam clip of them behaving intimately in a taxi. 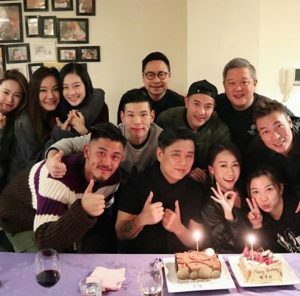 Those following the TVB starlet and singer would know they have been friends for some time now, posting group photos of each other on Instagram from time to time. Some might even say they have more photos of each other on their social media than of their significant others, Kenneth Ma (馬國明) and Sammi Cheng (鄭秀文) respectively. However, it turns out Jacqueline is also a friend of Sammi, Andy’s wife of five years. Last November, Sammi shared a video of Jacqueline working out with her on Instagram and praised the young actress’ moves. Jacqueline replied to the flattery by complimenting Sammi for being diligent and not resting. It seems like the 46-year-old artist was not weary of Jacqueline and even had a good relationship with her. More recently, Jacqueline celebrated her 30th birthday in January with her gym buddies, which included Edward Ma (馬志威) and Andy, and shared a group photo on Instagram. Sammi generously left Jacqueline birthday wishes and said the birthday girl resembled a 20-year-old instead of 30-year-old. Netizens were able to dig up other evidence of Jacqueline interacting with Sammi on social media, paving the path to enter her marriage. One such instance is when Jacqueline complimented Sammi for looking cool on Instagram just seven days ago. Not long after the cheating scandal erupted, Jacqueline immediately disabled the comment function on Instagram. 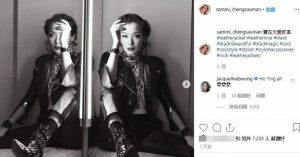 In turn, her older sister, Scarlett Wong, suffered as a large number of netizens flocked to Scarlett’s Instagram account to leave negative comments about Jacqueline’s character. 23 comments to Jacqueline Wong’s Friendship with Sammi Cheng Was Premeditated? just waiting TVB to either freeze her deep in the dungeon or fire her … her sweet little innocent image for dating with Kenneth is over with this scandal… her image is doom! Kenneth such a good guy and Sammi such a good friend how can she do something like this. It’s so hard to believe. And all this while, the parents and daughters remain very close knit. – they fly back regularly. You can see all the family gatherings in Scarlett’s IG. Jacqueline is also very close to Scarlett … really hard to believe she would deliberately be a 小三 (esp when she even knows the wife). This girl has a Masters in Psych, from the local uni here (the better harder one to get in) in Vancouver (if I am not mistaken). Very HARD to believe this is the good girl image I always had of her. To me, she’s not as pretty as Scarlett … but I always had thought she was trying hard in HK. Conflicting messages in today’s sociey – when we encourage modern 2019 women to go after what they want. Or you only have one life- live it! @nomad822 nope nothing is conflicting…you can go after what you want without being a horrible human being and getting involved with a married man. @scarlett013 Agree. Seeking one’s happiness doesn’t mean having the excuse to do so at the expense of another’s happiness. Not only has she hurt her boyfriend (if they were together when this happened), she was actually a friend of Sammi. Double disgust. @nomad822 You probably know better because you actually know them, but Wiki says she was studying her Masters in Business Admin at UBC before competing in Miss HK. Implying she didn’t finish the masters??? (Anna was one of the many teachers who volunteered to lead classes) knew Jacqueline. By sight, by what her mother shared of her family, through other classmates. Scarlett went to the same dance school too apparently. Looks are deceptive. It’s beyond LOW when you know someone’s married, and you KNOW his wife. I do not think the girls were sheltered. Their mom is pretty streetwise, you can also say calculative and materialistic. I recall in a divorce situation, her comment was – she asked the person: ” Does he give money? so that’s OK”. (I was like seriously? WTF). somethings may not be this simple. you can’t trust that this is all to the story. the way how the story unfolded, could be more to it. ET is all politics. I find it funny that all the news is about what Andy Hui did, when in fact both parties are to blame. Jacqueline is just as guilty yet no apology and not even a statement. At least we know her TVB career is toast, not that she was any good. @canadian It ius not on Jaynestars as yet but she has made a public apology now….But no one will forgive her. She better pack her bags and go back to Canada. @hohliu where? Could you share link? @hohliu I agree that Jacqueline needs to pack her bags and go back to Canada. Yes, she apologized (if you can call her generic post on social media an apology), but I doubt anyone is going to forgive her, especially if anything happens to Sammi (who is well-loved in the industry). So far, Sammi hasn’t responded to anything and most likely she is not going to respond, as that’s how her personality is (she rarely ever responds to stuff directly related to her personal life / relationships unless it has to do with her faith / religion) – the media has been scouring her social media to see if she posted anything, but so far nothing aside from switching her profile picture to a black and white one (which of course has people speculating and her friends worried). TVB freezing Jacqueline is a small consolation considering her actions (and sweet Kenneth still sticking up for her in his statement — ever the gentleman — though I think it’s kind of obvious their relationship is over, especially since this whole thing caused the media to go after his mom, which he also addressed when he finally gave his statement). Of course, Andy should be punished as well, though we all know how this industry works and most likely he won’t get hit too hard career-wise. Sure, all his work has been put on hold and his September HK Coliseum concert is most likely a no-go now, but pretty sure he will bounce back easily once this whole thing fades away – plus he has a lot of friends who will likely support him (probably not publicly but privately for sure). And the pain of having to live with his actions and possibly losing Sammi in the process (if they do separate this time around, most likely they aren’t going to be friends anymore like they were in the past), plus all the hate from Sammi’s fans and the general public, that itself is already huge punishment….as to whether that’s enough punishment or not, well, let’s see what happens once this thing settle in a few months…. @canadian Jacqueline finally responded, though pretty much just an apology on social media. TVB already froze her though, that has been confirmed by Virginia Lok. Kenneth responded as well and did an excellent job I might add. The way he handled the situation, the things he said, I wouldn’t be surprised if he gained a bunch more fans (I know for me, he gained tons of respect in my book). I hope the media will now leave Kenneth and his family alone….oh and Sammi too, the media needs to leave her alone as well! @llwy12 How did Kenneth respond? I feel terrible for him, his family and Sammi, especially. why apology? the only person she’s harmed is sammi, i don’t understand be so public about it. could have a conf to talk about the affair but not apology. @m0m0 Because everyone involved are public figures, celebrities with fan bases, and with the entertainment industry, audience support is everything (we’re the ones forking out money to buy these artists’ albums, buy tickets to watch their movies, spend time watching their TV series, etc)…its a financial and emotional investment for the fans / audiences and in an entertainment industry as small and tight-knit as HK’s, this is a big deal. Jacqueline didn’t just wrong Sammi, she wronged Sammi’s fans, Andy’s fans, both their families, and anyone who has supported and rooted for this couple over the past 3 decades (and yes, Andy did too of course since it takes two to tango, but since we’re talking specifically about Jacqueline, hence the comments are geared toward her). i get you, the fans and many people are upset at her action. we can talk about it and cuss her for doing whatever she did but she wronged no one other than sammi and kenneth. i guess she could admit her wrongdoing but not sure about a public apology. @cutie777 Me too is different than cheating, and shouldn’t be lumped in with this.. Me too is about the prevalence of unwanted sexual harassment and assault. It is about raising awareness to a problem that is universal and needs to change. This act was consensual but a violation of each’s commitment to their respective partners. 1) it is NOT just cheating … which is low enough. 2) it’s super LOW inhuman when you KNOW the dude’s wife … and you have a trusting bf behind you. 3) It’s like the recent Amazon divorce – they all knew each other! Family friends. 4) What IS also shocking: always had the impression that Andy was quite 迁就 and besotted with Sammi throughout the relationship. From breakup = > eventual marriage. 5) There were recent pictures of them jogging together. Ugh how fake a person he is.